Girl Scouts has the mission to build girls of courage, confidence, and character, who make the world a better place. Girls are engaged in activities related to science, technology, engineering, math, financial literacy, healthy living, and environmental leadership. Activities can be centered around individual girls, a small group, an entire troop, or service unit. As a non-profit organization we are dependent upon the assistance of adult volunteers. Our volunteers bring their experience and expertise to make the scouting involvement better for all girls. What are the requirements to join Girl Scouts? We welcome any and all girls that are in grades K-12 (includes home-schooled girls). For more than 100 years, Girl Scouts has prided itself on being an inclusive organization serving girls from all walks of life. If a child identifies as a girl and the child's family presents her as a girl, she will be accepted into girl scouts. What will my daughter get out of Girl Scouts? Girls will develop a sense of self, learn positive values, learn practical life skills, develop critical thinking, and feel connected to the community. Girls will also make friends, earn badges, participate in field trips and camping trips, and organize service projects. What is the time commitment involved in Girl Scouts? Girls are assigned to a troop by community troop organizers. Wherever possible, troops are formed according to schools and/or churches a girl attends. Troop leaders decide when, where, and how often a troop may meet. Many troops meet at least twice a month and work with families to find a good time and place to meet. What are the responsibilities of a parent/guardian? How much does it cost to be part of Girl Scouts? There is an annual fee of $15 per scout paid to Girl Scouts of Central Indiana. These fees help council and the service unit provide activity insurance, training, and activities to all girls. Each troop may also charge dues to enable the troop to fund activities. Adults volunteering with Girl Scouts must also register and the fee is $15 per adult. Where can I buy the Girl Scout uniform and patches? You can purchase the required uniform at the Girl Scouts of Central Indiana Store. You can access the store through their website at http://store.girlscoutsindiana.org/store/. You may have items shipped to you or you can pick them up at the store. The store is located in Suite 100 at 2611 Waterfront Parkway East Drive, Indianapolis, IN 46214 (just off I-465 at the Crawfordsville Road/Indiana 136 exit). 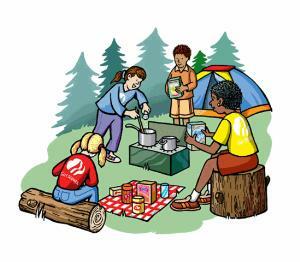 Yes, Girl Scouts do go camping but it is a gradual process that can include an entire troop, service unit, or family. What other activities are available to Girl Scouts? The Pike Service Unit offers a variety of events for the girls. Activities and events are also provided by GSCI and girls can participate at the troop level or individually.